Old batteries: Most shops that sell car batteries will accept an old one—and the responsibility of dealing with its toxic lead. Motor oil: The best way to handle used motor oil is to buy a drain pan with a tight-fitting lid so you can do two changes before bringing the oil to a service garage. In most states, garages are required to accept it. You can first transfer the oil to clean milk jugs, labeled accordingly. Antifreeze: Large service garages often have coolant recycling machines, so call around to find one. Just make sure the container and funnel you use are clean so the antifreeze can be recycled. Brake fluid: Pour used or excess brake fluid into an open container of cat litter kept away from pets and sources of ignition. Because the fluid is alcohol-based, it will evaporate over a few days. Send the litter to a landfill. London-based jeweler Noor Fares has revived a “rather unusual” 19th-century fad. In the era before photography became widespread, wealthy Europeans often commissioned small watercolor portraits of their loved ones’ eyes to be worn on brooches, bracelets, pendants, and rings. Fares’ update, the Prana Personalized Eye Necklace, makes the process easier by asking for a close-up photo that’s given to an Italian artist who hand-paints the image onto mother-of-pearl. 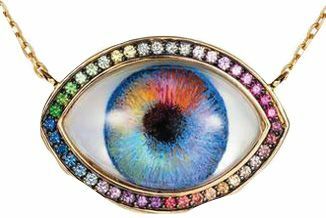 The eye portrait is set behind rock crystal on an 18-karat gold pendant accented with gemstones in a way that suggests eyelids. Expect a 12- to 14-week wait between order and delivery.